A view of Waikiki Beach on the waterfront of Honolulu, Hawaii's capital city. Honolulu joined the AARP Network of Age-Friendly Communities in 2013 to support its diverse and growing aging population. The Hawaii state capital city of Honolulu joined the AARP Network of Age-Friendly Communities in 2013 to support its diverse and growing aging population. 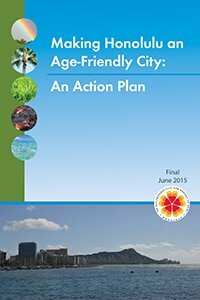 After two years of community engagement and planning, Honolulu’s Age-Friendly City Initiative released "Making Honolulu an Age-Friendly City," an action plan for improving the quality of life for all residents. The plan identifies goals and recommendations for six community features that the World Health Organization (WHO) has found impact the quality of life of older adults (referred to locally as kῡpuna). These areas of focus — or "domains" — for the island state's largest city are Outdoor Spaces and Buildings; Transportation; Housing; Communication and Social Involvement; Civic Participation and Employment; and Community Support and Health Services. A steering committee leads the initiative, and a Citizens Advisory Committee of approximately 90 community members from nonprofit organizations, businesses and city and county departments contributed to the overall plan. The committee divided into six working groups and for each domain identified a vision and the challenges, goals, strategies and implementation recommendations. The 2014 AARP Livable Community Survey of Honolulu, a focus group, expert interviews and public input gathered through a 2015 "Living Age-Friendly Summit" and action plan comment period all influenced the final document. The University of Hawai'i Center on Aging consulted on the initiative and led the development of the ultimate action plan. A technical committee focused on collecting and analyzing city data created a Geographic Information System (GIS) website with maps for each of the six domains that will track the city’s progress against its goals. With the release of the action plan, the implementation phase begins and extends over the next three years to 2018 when Honolulu and AARP will review the city’s progress toward becoming more age-friendly. In 2030, 24 percent of Hawaii’s population will be age 65 or older, compared to 21 percent nationally. By 2040, 27 percent of Honolulu residents will be age 65 or older. Hawaii leads the nation in longevity and has the longest healthy life expectancy, meaning that a 65-year-old resident can expect to live 16.2 additional years of life in good health. More than half of Honolulu’s older adults, or 57 percent, have lived in their communities for 20 years or more. Hawaii leads the nation in longevity and has the longest healthy life expectancy (HLE), meaning that a 65-year-old resident can expect to live 16.2 additional years of life in good health. The report includes a wealth of information for community leaders, businesses and citizens. For each age-friendly domain, the action plan provides a vision, goals, Honolulu's current context, strengths, challenges, opportunities for improvement and an implementation plan (pages 13-109). Appendix A of the plan breaks out goals within each domain and designates action steps, success metrics and three-year benchmarks. Specific organizations are designated leads for each goal, but all community members can play a role in making the city more age-friendly.